A 7-year-old who was deprived of liberty faces a risk of having a teacher presenting charges against him. The little boy allegedly attacked his teacher after she called him out because he was playing with his food during mealtime. The boy, according to his father Mr. Rolando Fuentes, felt the pressure to play with his food because some of his classmates were cheering him up. At first, the little boy refused, but then he gave in. Unfortunately for the little boy, is not the first time he’s involved in a violent scene. In November, he threw a tantrum that led to a teacher getting kicked by him. The New York Daily News claims the police had to be called, while The Washington Post declares that the matter was handled internally, without getting the police force involved. The conflict started when the little boy was having breakfast in the cafeteria, and his friends began to compel him to “mess with his milk and cereal.” The boy refused at first but then, with the non-stopping annoyance, he started playing with his meal, and another classmate went to a substitute teacher and accused the boy of making a mess with his food. The teacher did not hesitate to go to the boy’s table, where she called him out and took him outside the cafeteria. The little boy told his father the teacher repeatedly argued that if he kept playing with his food, she would throw it away. Mr. Fuentes says his son just told him that part of the story, but the fight and how it started remains clouded, as the only known version is the one given by the teacher. She claims the boy began to attack her, punching her back while they were in the hallway. She was trying to reach for some fellow teachers to inform the boy’s attitude, which she dubbed as negative towards her warnings. The teacher explained that she could restrain the boy from following attempts of attack, but as the boy kept fighting with all of his body. The force both of them used to struggle ended up lead the pair to fall to the ground. The police report alleges that even then, the boy did not stop, driving him to pull the teacher’s hair. The boy was restrained, then sent to the principal’s office. The little boy’s parents were called, and they later arrived at the office to discuss the situation. Mr. Fuentes states that he asked the little boy if he had attacked the teacher and pulled her hair, the boy remained silent. The parents were told that the kid needed to be taken to the hospital to be checked, so they stayed in the school waiting to get their son’s bag. The waiting lasted almost an hour, and when they finally were able to take the boy from the place, a police officer appeared asking to handcuff the child. The desperate father asked the police to let him ride with the boy, he even offered himself to be handcuffed, he would do anything if it meant keeping his child away from the bracelets, but all of his petitions were ignored. 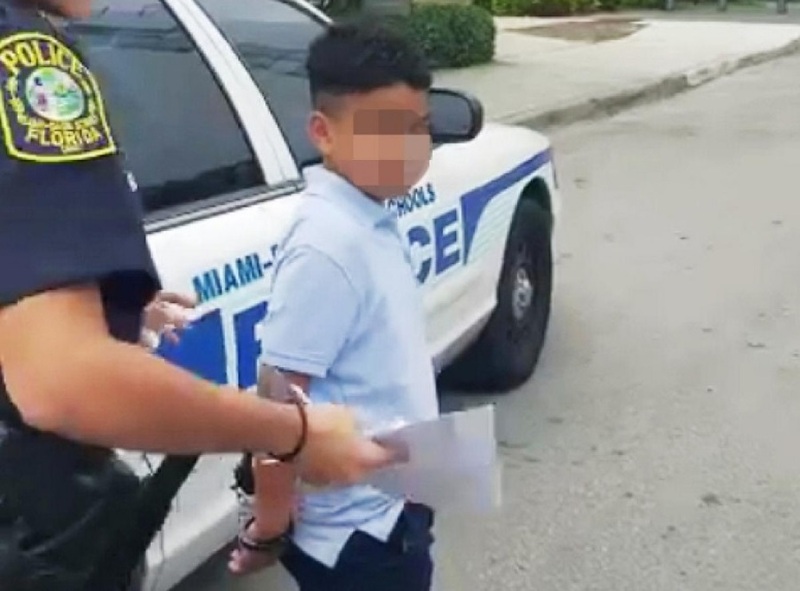 The police alleged that the handcuffs were necessary in case the boy kept trying to attack people inside the patrol car, also stating that it was a usual procedure. The mother of the boy, Mercy Alvarez, felt as she states “heartbroken,” and she kept telling the boy that everything would be okay, while she recorded the whole shocking situation with her cellphone. After the incident, Mr. Fuentes said that the kid was cataloged as a “danger to society,” a surprising adjective to him, claiming his little son can’t be a danger to society since the boy is only a seven years old. Ms. Alvarez, claims that since the last incident, which happened in November, the boy was taken to a hospital to get psychiatric help, but the doctors told him that his son was just fine. And the teachers from the school, as well as the principal, asked the parents to take the kid to a hospital again, leading to the whole handcuffing situation, but the little boy was discharged with no relevant results. The teacher explained that she did not have any visible injuries from the boy’s attack, but that she will keep in mind the idea of filing charges against the minor. His father could only answer that it would not happen. Mr. Fuentes claims that his 7-year-old is in fear, a fear that keeps him from sleep.